Casting our nets in Tanzania……… This year’s Mid-South District mission trip took us to Ukerewe Island. 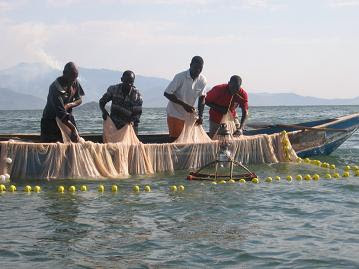 Ukerewe is the largest island in Lake Victoria, it is approximately 25 miles long and 10 miles wide with an area of about 200 square miles locate just (25 nautical miles) north of Mwanza It is linked by two ferry boats that carry everything that goes to or comes from the island. Each day at 8 and 8:30 the ferry boats leave the harbor in Nansio and head south to Mwanza. The arrival and departure of the ferry’s is a big event in the Nansio, the main town on Ukerewe. The road to the boat dock is lined with people selling all sorts of items, trucks loaded with product to ship are loaded on the ferrys. The shoreline of Ukerewe Island is carved into numerous bays and it is surrounded by at least a dozen smaller islands. Each morning and evenings the shoreline on these little bays are covered with people coming to get water and to bathe. Each night the island is surrounded by hundreds of fishing boats lit by a lantern. Fishing is an important industry in Ukerewe District and a lot of fishing boats, as well as canoes and traditional dhows, can be seen plying the narrow waters between the many smaller islands and villages. Ukerewe Island is a rocky island with small hills. The landscape varies between flat land, cassava and rice fields, plantations, rocks, rocky and sandy shores, and beautiful lakeshore. Most of the 150,000 inhabitants are living in the many traditional villages scattered around the island. Each day we left our little motel in Nansio early to head out to a small village and the new congregation. The main road out of Nansio was tar and gravel for about 5 miles then it turned into a dirt road. We arrived at the villages each day with a great greeting from the congregation. We usually had a meeting where we signed their guest book and introduced ourselves. We then divided into teams to go out to individual homes to talk and share the gospel message. We invited the family to the church service and the movie. We went back to the meeting area to prepare for the service. The meeting area could be under a Mango tree or in a government building of some sort. In the late afternoon, we had a worship service of singing, preaching and baptisms. We would then eat dinner and wait for darkness when we could show the movie, (The Life of Christ) and have more baptisms. We left the island with many new friends after preaching to over 2000 and visiting the homes of over 70 families and 489 were baptized.